Zain Africa Challenge is a vibrant and thriving community. Our new Fan Page is LOADED with great features, including an online Ultimate Challenge game where you can win Zain airtime and even a laptop! It's the perfect place to connect with ZAC friends and keep up with the latest developments on the programme. To join, you must be registered as a user on Facebook. Fill in the Sign Up information. Once you are registered on Facebook, type “Zain Africa Challenge” in the search box (at the top of your page). . 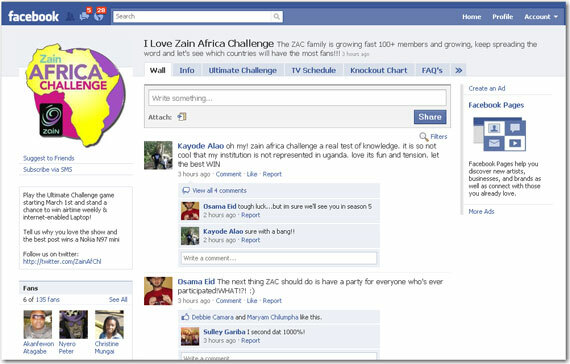 When the "I Love Zain Africa Challenge" page appears you can click to become a fan!. Authorized requests to join are generally approved with 24 hours. Once you're a member of the group, you can contribute to the discussion groups, reconnect with old ZAC friends and share updates!